Working a trade show or expo? Make sure you stand out in the crowd with our custom trade show displays! FlagandBanner.com has been creating custom flags, banners, signs, and decals for customers around the World since 1975. Today, we are one of America's most respected designers and producers of high-quality graphics. We know Custom and We make it Easy. We offer custom embroidery and appliqued flags as many of our competitors are phasing out this beautiful technique. Custom flags, banners, accessories, and gifts are perfect for special events, grand openings, sales, trade shows, presentations, car lots, storefronts, mall areas, museums, schools, religious buildings, fundraisers, family reunions, weddings, and more. Click here for our Custom Artwork Template. Contact us today for a FREE Custom Quote! Call us at (800) 445-0653, email us at sales@flagandbanner.com, or fill out our handy Quote Request Form. We work with all Materials to create the perfect custom items for you: Adhesive Vinyl, Canvas/Awning, Cotton, Dacron, Foam Core™, Magnetics, MainStreet™, Nylon, Polyester, Reflective Vinyl, Satin, Scrim, Sintra™, Sunbrella™, Vinyl Mesh...and more! Use the buttons below to find out more information, get a free quote or request literature. Vinyl banners are a perfect way to make a statement for little investment. A banner can be customized for any occasion or event and practically any size from small to building size. Yes. Building size. Click here for an example of that! Over the past four decades FlagandBanner.com has designed everything from text only banners for a family reunion to huge building size banners to custom specialty installations that truly make our slogan of "More than just a flag store" a reality. 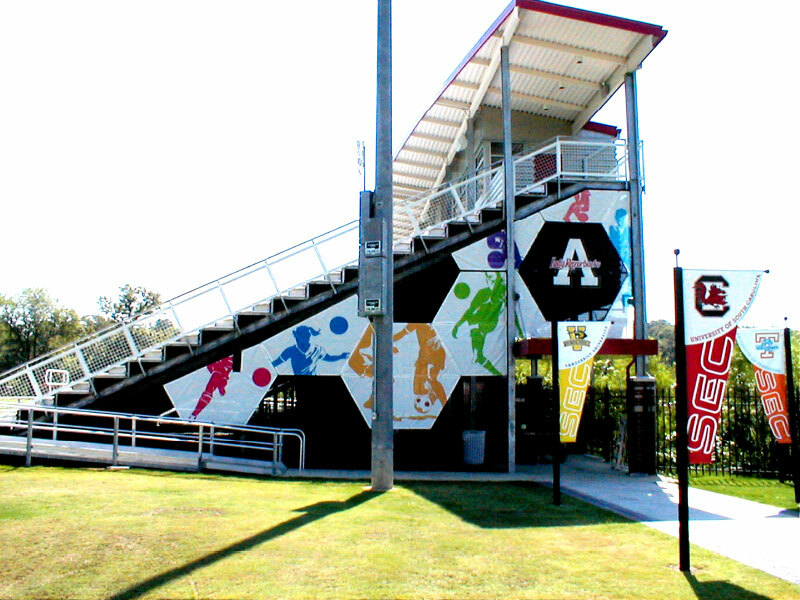 Click here to see an installation we did for the University of Arkansas Lady Razorbacks Soccer field. The challenge was to design an under bleacher decorative piece that covered the under bleacher area but still allowed air flow etc. Plus they wanted SEC banners to line the walk way leading to the bleacher area. It was both useful and beautiful. We met this challenge with unconventional use of vinyl banners in unique shapes. Custom flag projects can be unconventional too. Most flags are either rectangular or swallowtail but once in a while someone will come to us with an idea that is a little unconventional. One such project was for fabric leaves made from weather resistant fabric, such as those used in flags. We of course accepted the challenge and created something just a bit different for our client. 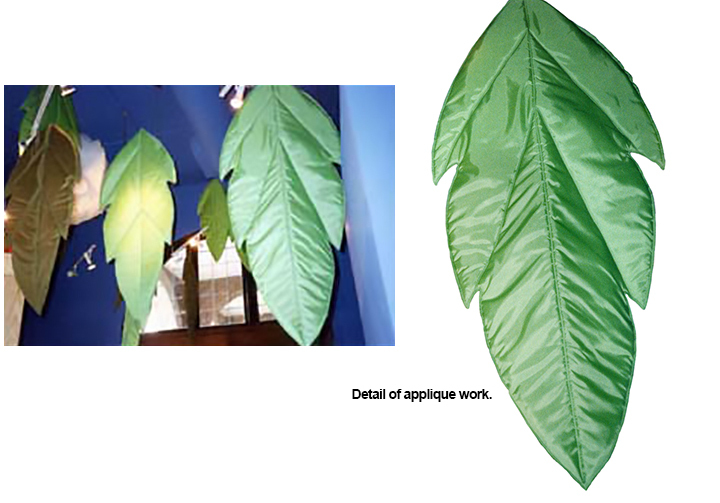 We cut various colors of green and even brown flag material into large leaf shapes, sewn together for depth and then used an applique technique to give the leaves 'veins' and almost a soft sculptural form. This project while not really a flag...it used flag material and the amazing skills of our in house seamstresses. Click here to see the final result. So as you can see, we truly are more than just a flag store. No matter the occasion, event or challenge we are more than prepared with 4 decades of experience to give your project that unique look you are seeking. Anyone can make a rectangularbanner or flag but can they create something totally unique and different from anyone else? Call us today to talk to our experts at 800.445.0653. A display you can move with just one hand! The dye-sub printing process actually dyes the fabric for optimum durability and versatility. The Custom Banner Wall uses a special fabric that you can machine wash the banner if needed. The lightweight banner stand is easy to assemble and collapse. Includes carrying case. Quantity pricing available.